Summarizing data derived from a four-year combined longitudinal/ cross-sectional comparative study of the implementation of one standards-based middle school curriculum program, Mathematics in Context, this book demonstrates the challenges of conducting comparative longitudinal research in the reality of school life. 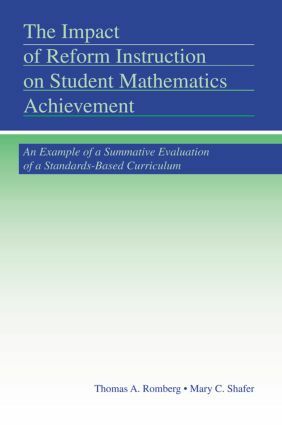 What is the impact on student performance of the Mathematics in Context instructional approach, which differs from most conventional mathematics texts in both content and expected pedagogy? How is this impact different from that of traditional instruction on student performance? What variables associated with classroom instruction account for variation in student performance? The researchers examined a range of variables that affected data collection. These variations highlight the need to study the effects of the culture in which student learning is situated when analyzing the impact of standards-based curricula on student achievement. This book is directed to educational researchers interested in curriculum implementation, mathematics educators interested in the effects of using reform curriculum materials in classrooms, evaluators and research methodologists interested in structural modeling and scaling of instructional variables, and educational policy makers concerned about reform efforts. Findings about student achievement, question 1: what is the impact of the MiC instructional approach on student achievement? Findings about student achievement, question 2: how is the impact of instruction using MiC diﬀerent from that of conventional instruction on student performance? Findings about student achievement, question 3: what variables associated with classroom instruction account for variation in student performance?